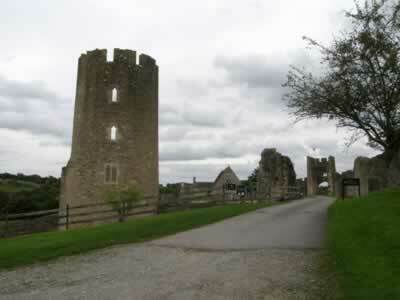 Farleigh Hungerford Castle was originally an early 14th century stone manor house, founded by the Montfort family. Between 1370-80 Sir Thomas de Hungerford fortified the mansion house, built the hall and founded the quadrangular castle. In 1383, King Richard II pardoned him for crenellating his manor of Farle Mountfort without licence. In 1420-30, Sir Walter Hungerford added the polygonal outer court and a barbican to the inner gatehouse, which was flanked by round-fronted towers. Positioned on a low promontory, which is encased by scarps and a once wet moat, the inner court is now reduced to foundations with only the remains of two cylindrical angle towers upstanding. The outer court is still encased by an almost complete curtain wall, which is flanked by the priest's house, the square two storey East Gate, a two storey round tower, the remains of another round tower and the West Gate. The mid 14th century village church, which now stands in the outer court, was also converted into the family mausoleum and the chapel of St Leonard. The castle suffered only slight damage during the Civil War but soon afterwards the buildings fell into a complete state of disrepair and were described as very ruinous in 1701. 10 miles south-west is Nunney Castle. Farleigh Hungerford Castle is located in the village centre, off the A366. 18 miles south-west of Bristol, on the A4-B3110. The site is owned by English Heritage and is open daily, April to September 10:00-6:00pm, October 10:00-5:00pm, Saturday and Sunday November to March 10:00-4:00pm.